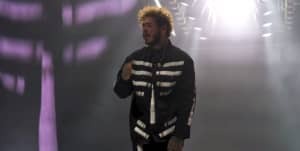 Post Malone is heading out on tour with Fetty Wap in January, and hopefully fans that go to see him will hear this one get played out. "Boy Bandz" is a Shlohmo-produced (!) banger, and the video sees the White Iverson star swaying in front of a gorgeous gradient sunset. Both he and the WEDIDIT boss are in top form here. Watch above, and revisit everything you need to know about Post Malone.